Vehicles drive along the Don Valley Parkway as heavy rains swell the adjacent Don River Friday May 5, 2017. Scheduled maintenance work on the Don Valley Parkway this weekend has been cancelled in light of forecasted freezing rain. The roadway was supposed to be closed between April 13 and April 16 for annual maintenance, but a significant rainfall warning for Toronto has forced the city to put a hold on their plans. Freezing rain is expected to hit the GTA early Thursday. 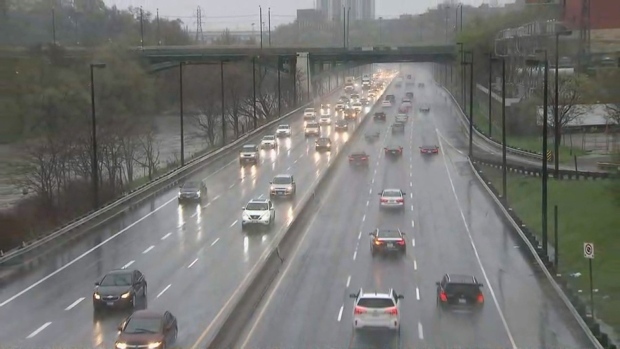 Residents in the GTA can expect at least 20 millimeters of rain over the weekend and those in southern Ontario can also expect gusty winds up to 60 kilometres an hour. A news release issued by the City of Toronto Wednesday said that “chilly temperatures are not conducive to good paving” and that is why the maintenance has been cancelled. The long list of repairs involved in the annual maintenance include resurfacing of the roadway, patching asphalt, sealing cracks, pothole repair, bridge inspection, and guiderail repair. The construction would have resulted in a two-way closure between Highway 401/404 and the Gardiner Expressway between 11 p.m. on Friday to 5 a.m. on Monday. There is a chance a second closure will be needed if the repairs cannot be completed in a single weekend. The City of Toronto is expected to inform the public next week when the closure will occur.